I often long for the public square. A place to stop, to have a coffee, to look at people, to soak up the sun, to collect my thoughts and in my respite, come up with new ones. Aren’t many places to do that in Chicago. Usually what we call a plaza has cars running on three sides of it and does not lend itself to contemplation. Millennium Park is nice because it’s raised up from the traffic. The plaza at the John Hancock is nice because it’s sunken down away from the traffic. It also has a raging water fountain to drown out the car sounds. I’ve liked it so much on a sunny day I affectionately call it, in Italian, “Piazza Giovanni” (Giovanni, as in John, as in Hancock.) 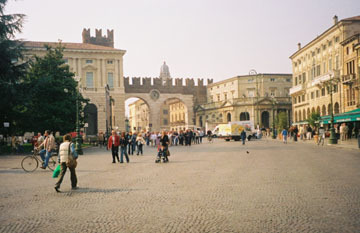 When I tell my friends, “I’ll meet you at Piazza Giovanni,” by now they know where I mean. 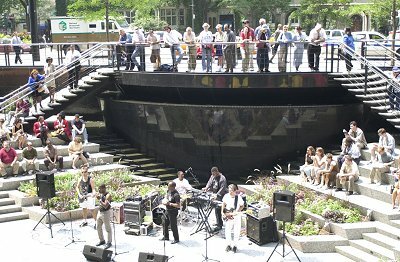 We need public squares in Chicago. Where we can safely dance in the streets! They’re breaks in the bustle of the city, like these strategically-placed photos are breaks in the density of this text. The other day I went to Taylor Street to see the National Italian-American Sports Hall of Fame. 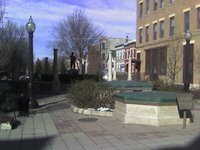 And there, on a gorgeous Global Warming February Day, I stumbled across a real square to sit in.